DELHI – A new state-by-state health analysis in India finds that over two decades heart- and lung-related conditions, as well as other non-communicable diseases (NCDs), have surpassed infectious diseases, such as diarrhea and tuberculosis, as the nation’s leading killers. The extent of this difference, however, varies significantly among the nation’s 29 states and seven union territories. The study, which covers 1990 through 2016, also concludes that while child and maternal malnutrition has dropped substantially, this remains the most pernicious risk factor causing loss of healthy life. Moreover, road injuries and suicides are leading contributors to death among young people, with a nearly four-fold difference in suicide rates among different Indian states. The study, published today in the international medical journal The Lancet, notes that life expectancy at birth improved from about 60 years of age in 1990 to just over 70 years in 2016 for females, and from about 58 years to nearly 67 years for males. However, among states, there are inequalities of up to 10 years. The overall loss of healthy life from all diseases and conditions together was about one-third less per person in India in 2016 as compared to 1990. However, progress is mixed. The disease burden rate at present is significantly higher in states in a less advanced phase of development, such as Assam, Uttar Pradesh, and other poorer northern states, as compared with those in the nation’s most advanced phases of development, such as Kerala and Goa. In addition, water quality and sanitation conditions have improved over the past 26 years, but they remain major factors in disease transmission and, by comparison, their contribution to disease burden is 40 times more per person in India than in China. Air pollution also has emerged as a growing health risk in India, which has some of the most polluted air in the world. While indoor air pollution has decreased since 1990, outdoor pollution has increased from power production, industry, vehicles, construction, and waste burning. 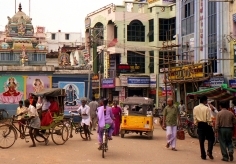 The top conditions in India causing health loss are (in order of severity): ischemic heart disease, chronic obstructive pulmonary disease (COPD), diarrhea, lower respiratory infections, stroke, iron-deficiency anemia, preterm birth complications, tuberculosis, sensory organ diseases such as eyesight and hearing impairments, road injuries, suicide, low back and neck pain, and diabetes. Urbanization and aging have led to increasing poor health conditions related to non-communicable diseases in all states. The fastest-growing causes of disease burden over the last 26 years were diabetes (rate increased by 80%) and ischemic heart disease (up 34%). More than 60% of deaths, about 6.1 million, in 2016 were due to NCDs, up from about 38% in 1990. Even states with similar levels of development showed striking differences in rates of death and illness from some leading NCDs. For instance, Punjab has much higher rates of premature death and ill health due to diabetes and ischemic heart disease, but lower rates due to COPD compared to neighboring Himachal Pradesh, despite the two states both being at an advanced level. Similarly, Uttar Pradesh has much higher rates due to COPD and tuberculosis, but lower rates from stroke compared to Madhya Pradesh, despite both states being at a similarly early stage of epidemiological transition. These differences are due to variations in exposures to risk factors as well as other determinants. Urbanization is responsible for rising deaths and health loss from road injuries in most states since 1990, highlighting the lack of a comprehensive national policy for injury prevention. Road injures were highest in Jammu and Kashmir, with rates of premature death and illness nearly three times higher than that of Meghalaya. The burden of suicide was highest in Tripura, with rates almost six times higher than in Nagaland. “Larger and more organized efforts, supported by greater financial and human resources, are needed to control the growing burden of NCDs and injuries,” said Dr. Dandona. Other highly preventable risks, such as diets high in salt and low in vegetables and fruit, high blood pressure, high cholesterol, and high body mass index, are contributing to the growing burden of non-communicable diseases. Together, they accounted for almost a quarter of poor health in 2016 – over twice that from 1990. The rate of under-age-5 mortality has dropped substantially since 1990 in all states; however, there was a more than four-fold difference between the top and bottom performing states. Of the total disease burden in 1990, 61% was due to communicable, maternal, neonatal, and nutritional diseases; this dropped to 33% in 2016. There was a corresponding increase in non-communicable diseases to 55% in 2016, as compared to 31% in 1990. Injuries increased from 9% of total burden in 1990 to 12% in 2016. Major non-communicable diseases increased throughout India, including cardiovascular diseases, diabetes, mental health and neurological disorders, cancers, musculoskeletal disorders, and chronic kidney disease. More data are available through IHME’s data visualization at: https://vizhub.healthdata.org/gbd-compare/india. 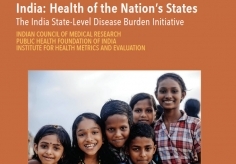 The study, “Nations within a nation: variations in epidemiological transition across the states of India, 1990–2016 in the Global Burden of Disease Study,” was announced November 14 in Delhi at an event hosted by Indian Council of Medical Research, Public Health Foundation of India, and IHME, in collaboration with the Ministry of Health and Family Welfare, Government of India.